Asolo Hiking Boots: Learn Why I Love Them - 3,000 Miles & No Blisters! Why I Love My Asolo Hiking Boots: 3,000 Miles & No Blisters! Honestly, I love my Asolo hiking boots. Come learn why I’ve hiked over 3,000 miles only in my Asolo GTX hiking boot, one of the best waterproof boots for hiking. Frankly, there’s no better boot. I’ve hiked all over Glacier National Park in them (500+ miles in one summer! ), I’ve hiked from the southwest corner of France to the northwest corner of Spain in one summer in them, and I’ve hiked all over Colorado with them. God’s honest truth: this is just me. I love the outdoors and I love buying the best gear. And when it comes to the best hiking boots, Asolo takes the crown. 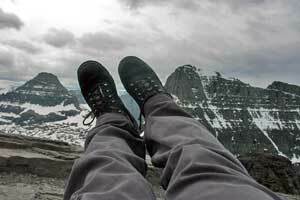 Why Asolo Hiking Boots Rock! Durability – I’ve had my Asolo GTX hiking boots for over 5 years and have hiked over 3,000 miles in them and they are still going strong! Actually, I left one important factor off that list so that I can bring special attention to it: Blisters! Blisters. Those painful, nagging, burning spots on your foot that can ruin an entire vacation. Blisters. How I loathe thee. Or, how I would loathe thee if I ever received them. Yes, you read that correctly. I have never, not once, received a blister while hiking or backpacking in my Asolo hiking boots. When I hiked the Camino de Santiago in Spain with 12 other students from the University of Michigan, everyone got at least one blister. Me? Not one. And that’s why Asolo makes the best hiking boots. OK, I’m going to give you a little insider tips on the best hiking boots Asolo makes and why they are better than their competition. I own them. My wife owns them (if you’ve read a lot of this website, you’ll notice that I’ve had a girlfriend for a while–well, she became my wife!). How many blisters have the two of us had from them? Zero. Considering they only have 4-5 star reviews on REI.com, I’d say you can’t go wrong with any of them. They are all made of Goretex & leather, all have incredible breathability, and all provide high ankle protection. I made a full video review of my Asolo FSN 95 GTX boots. You can click that link for the review, or just watch the video below to see exactly how much I love these hiking boots. Asolo’s line of TPS hiking boots are their all leather hiking boots. Personally, I’m not the biggest fan of leather hiking boots. Why are leather hiking boots better for backpacking? Well, when you’re on the trail with a heavy backpack, your feet are going to hurt. Leather provides additional stability and shock absorption. They also are better protected against the elements, making them better waterproof hiking boots. Me? I buy ultralight backpacks and other ultralight backpacking gear, so I hate extra weight slowing me down. And leather boots are extra weight. 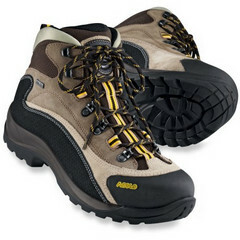 But if you’re gonna go leather instead of Goretex, Asolo’s hiking boots rock in that department, too! 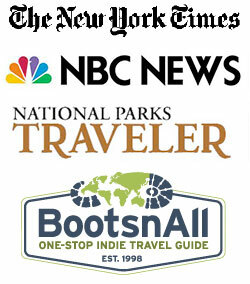 Again, all the Asolo hiking boots have dozens of reviews and all are 4-5 stars at REI. I seriously cannot rave enough about Asolo. They just rock. Allyson, my wife, owns the Asolo TPS 520 GV boots. We made a full review of the Asolo TPS 520 GV hiking boots here. I hate blisters, I hate wet socks. My Asolo hiking boots allow me to avoid both. Where to Buy Asolo Hiking Boots? REI – My personal favorite. Membership discounts, 100% customer satisfaction so you can return anything for any reason. Plus free shipping to stores. Men & Women Hiking Shoes: Read my recommendations on the best men hiking shoes and best womens hiking shoes. I will keep checking back. I have been skeptical of the reviews on some sites and am glad to find someone who actually uses the products they review. I have no good local store to buy quality hiking boots so I shop online. I use REI, Sierra Trading Post and Amazon. My Asolos and Scarpas are my go to boots. Thanks 🙂 I put a lot of blood, sweat and tears into making sure my reviews are accurately portrayed (and the gear tested to the limits). Never owned a pair of Scarpas, but have heard great things about them! Would you have an interest in writing a review for your boots? Shoot me a note here, if you are. I also recently launched a video review section where I interview outdoor junkies about the gear they use, know, and love (or hate). You can check that out here. Completely agree. Best boots I’ve ever owned, on my 2nd pair of fugitive’s. I think they would last forever if i didnt wear down the heals from walking on pavement (hundreds of miles and miles). great review.